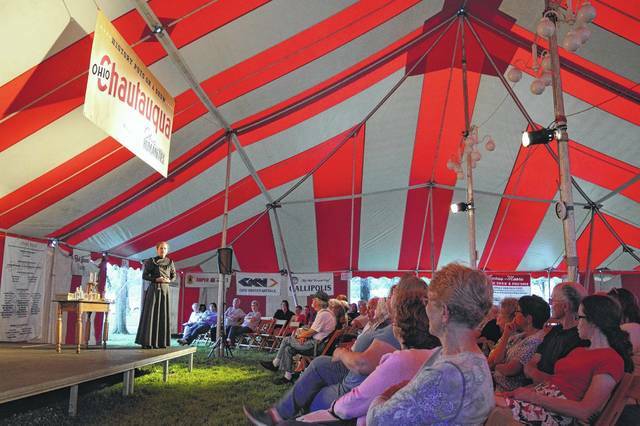 GALLIPOLIS — The Ohio Chautauqua is set to return to the Gallipolis City Park on June 12-16. Ohio Chautauqua programs are a unique mixture of education and entertainment where individuals can explore the lives and legacies of notable characters throughout history. Each year, the red and white striped tent will visit communities across the state presenting themed-programs to audiences.Each evening, a trained scholar will assume the costume and character of a historical figure, presenting an an engaging living history performance. Everyone meets under the old fashioned red and white striped Chautauqua tent to learn from and talk with famous characters from the past. In addition to major living history presentations, each scholar will present daytime workshops for children and adults in venues throughout the host community. Tuesday through Saturday evenings will feature another scholar presenting another character. Tuesday features Susan Marie Frontczak as Erma Bombeck, a humorist popular for a newspaper column centered on suburban home life. Wednesday will present Fred Blanco as Cesar Chavez, labor leader and civil rights activist. Thursday under the big top will be Dr. Sally Ann Drucker portraying Betty Friedan, activist, writer and feminist. Friday will have Dr. J. Holmes Armstead as Benjamin O. Davis Jr., Tuskegee Airmen and US Airforce general, and on Saturday Jeremy Meier will portray Robert F. Kennedy, American politician assassinated in 1968. Each night will start with live music from a different artist each night at 6:30 p.m. with performances starting at 7:30 p.m. The whole event will take place under a big top tent in Gallipolis City Park. During the day there will be program offerings for youth at 10:30 a.m. on various topics by the scholars. Adult programs will be available at 2:30 p.m. as well, featuring sessions from the scholars. The daytime programs will take place at the Bossard Memorial Library. Check out www.visitgallia.com for program schedules and host cities of Ohio Chautauqua In the event of inclement weather, evening performances will be held at the Ariel Opera House.